After tropical storm Earl disrupted their 2010 holiday on Anegada, Italian couple Professor Paola Ciarlantini and Dr. Silvano Scarponi stayed in Tortola for a week, but returned to Italy vowing to come back to the Territory and visit Anegada, an island they had briefly seen in 2003. Silvano is the head physician of three hospitals (Gubbio, Assisi, Citta di Castello) in the Marche Region and one of the top gynaecology surgeons in Italy; Paola holds three PhDs and teaches at the Piccinni Conservatory in Bari, she is also a conductor and composer. The stories on Anegada’s magic beauty impressed the couple who were determined to see and experience the island during this year’s holiday. They returned to the British Virgin Islands at the end of April and ventured into their nine day visit of lovely Anegada. At the end of the trip they were so in love with the island that they decided to share their experience with The Island Sun newspaper. 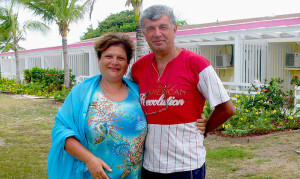 Professor Ciarlantini and Dr. Scarponi began their account by saying that “Anegada is a wonderful island! In these times when there are few destinations in the world that are still in truly pristine conditions, it is such a rare find. We can only congratulate the people and Government for keeping the BVI from mass tourism and commend the tourism and hospitality sector for the great service, which was another aspect that impressed us”. She added that she is confident that local people and people who live here will do what they have to do to avoid the deterioration of their major asset which is nature. She noted that, among many other things, the difference between the BVI and other places relates to tipping issues. She said the tipping culture threw her off when she visited other places. The Scarponis stay was made more special by the Anegada Reef Hotel where Vivian Wheatley and her staff made their holiday even more pleasant and special: the cuisine, the room, the personal touch, the exquisite kindness and hospitality were magnificent and spontaneous, the couple said.